I love roses—especially the edible ones. Just look at the photo of the simple, white, elegant blossom set against its background of deep-green leaves. What a perfect picture it makes on May 15, a stunning spring day here in piedmont Maryland. Yes, the photo shows a member of the rose family. And, yes, it isn’t a Knockout, at least to the thinking of some. But I think it will be a knockout some late-July or August morning when I take a bowl out to our garden to begin picking our Triple Crown blackberries. It will be a miracle if the first few huge berries make it from vine to hand to bowl. Many will suffer, and I will enjoy, the alternate route: vine to hand to mouth. So here’s a cheer for edible roses. I have only five of the thornless Triple Crown variety, but they satisfy our berry needs for a month, and we freeze and bag extras to add excitement to wintertime oatmeal, waffles, or fruit salads. Oh the delight of May blossoms and August berries. 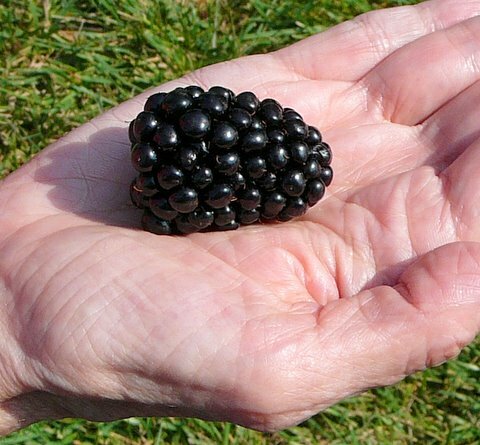 The finest restaurant in town has no rival to the Triple Crown blackberries that I will pick and eat in our garden. ← Is it safe to eat lettuce amid E. coli outbreak? 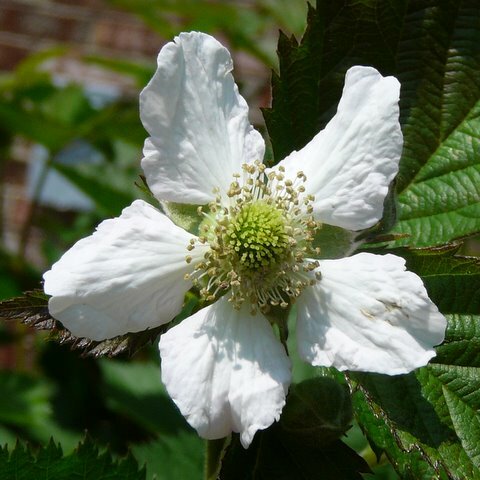 The anticipation of eating a luscious blackberry later certainly doubles the enjoyment of this flower now. A feast for the eyes and the palate. Bob – VERRRRY nice photo!!! Hello mss & TiiuGardens: Yes, anticipation if part of gardening delight. The Triple Crowns today are covered with blossoms. I can hardly wait for the berries to mature.